A Canadian online pharmacy is a just like your neighborhood pharmacy except that it is located in Canada and instead of picking up medications, they are mailed directly to your home. It allows you to fill prescriptions written by your American physician or doctor in a licensed Canadian pharmacy in order to take advantage of the price controls which the Canadian government places on all prescription drugs. A Canadian pharmacy organization facilitates the review of your prescriptions and your medical health by a licensed Canadian physician before having your prescriptions filled at licensed Canadian pharmacy. American prescriptions need to be reviewed and "co-signed" by a licensed Canadian physician before they can be accepted at a Canadian pharmacy to be filled. This is the same procedure you would follow if you happened to be traveling in Canada and needed to have your prescriptions filled because you were running low. Physicians in Canada typically charge a fee to review your medical history and prescriptions before "co-signing" your American prescription. By law, Canadian pharmacies cannot accept American prescriptions until they have been signed by a licensed Canadian physician. Canadian online pharmacies simplify this entire procedure by offering mail-order prescriptions from our affiliate Canadian pharmacies. 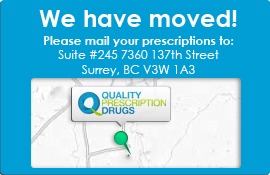 All prescriptions are then shipped out using the fastest available shipping method from our pharmacy directly to your home. Ship your prescriptions via the fastest available shipping method directly to your home. We pride ourselves in the quality of service which we provide to all of our customers and hope that you can save money on your prescriptions by using our service! Benefit from further savings by using coupons to save on all your prescription needs! Use pharmacy coupons to save big when buying your medication.